Let’s take a look at what this group had to say about tech and healthcare. What’s the next big frontier in digital health innovation? Dr. Baptiste led off the conversation here by introducing the idea that computer diagnostics - especially in radiology - is going to be an interesting field in the future where computer operators will be able to read x-rays and CT scans. Cheek and Dr. Childers both drew from their experience in the field of patient experience, including the work Cheek’s company EverlyWell is doing to give people more control over their lab testing results. 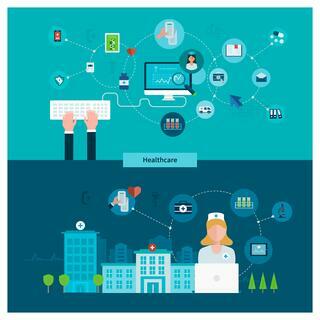 What are the challenges facing healthcare and tech? Dr. Jacobson noted here that the notoriously long sales cycle in healthcare - the various approval levels and hoops you have to jump through - inhibits innovation because it’s tough for startups to operate with such long sales cycles, and startups are where these tech innovations are coming from. There was a lot of discussion too around the fact that there isn’t a singular healthcare record, and that the current major EMRs are very difficult to interconnect. This results in a very fragmented space in which the portals physicians and facilities are using are not connecting to the major EMRs. How is uncertainty of the future of the Affordable Care Act affecting your work? Interestingly, everyone on the panel felt that while it would certainly get modified, it isn’t going away. They mentioned that since the implementation of the ACA deductibles have gone up, people are paying more out of pocket, and are paying more for healthcare in general - but without it, 30 million people won’t have insurance. As Dr. Jacobson put it, it’s kind of a double edged sword. Also notable was that there was a consensus among panelists that if you’re trying to provide a better patient experience, better outcomes, and a better quality of life, changes to the ACA aren’t going to impact anything that you’re doing. Dr. Baptiste doesn’t “lose sleep over it,” even though he’s a physician. As such, the panel agreed that the ACA wasn’t going to have a significant impact on digital health entrepreneurs and innovation. There’s a lot of noise about digital tools supposedly helping doctors and nurses do their jobs, but aren’t many of them adding more complexity and tasks to their daily routine - meaning less time with patients? Dr. Baptiste said that as a physician, he’s presented a new gizmo or gadget several times a month, typically discounting them because they don’t save time or money. He believes tech that saves money will be really useful - and successful - technology. Dr. Childers said you have to be careful because you don’t just want to provide MORE data, but rather, the real challenge is getting them the RIGHT data. Dr. Jacobson chimed in that getting TIMELY data is equally important, and everyone agreed that it is critical to make sure technology does not result in practitioners spend even less time at the bedside. What is going to be the impact of artificial intelligence on the healthcare industry? The entire panel agreed that AI may result in less need for doctors, but will never eliminate the need for them entirely. Cheek believes that AI will mostly influence healthcare in ways that patients won’t even be aware of, behind the scenes. Dr. Baptiste asserted that it will be most valuable in helping to give timely insights into what’s going on with a patient. What innovations do you predict will have a big impact on healthcare in the future? Dr. Childers, a linguist, told the audience about how we’re learning that speech patterns can predict mental illness. For example, the way that a child speaks in elementary school could predict schizophrenia. Cheek said that there’s a lot of interesting work going on in developing screening tools for diseases like colon cancer that are more powerful and less invasive, and that in the next ten years she expects that we’ll see major progress in the area of Alzheimer's. Lastly, Dr. Baptiste talked about how the “liquid biopsy” will profoundly impact health care by being able to provide much better diagnoses without having to do physical biopsies. That’s it for today, I hope you’ve found the insights of this panel as fascinating as I did! Thanks to GA Austin for inviting Dr. Jacobson to host the event, it was a treat.